Cutting a banana is a simple food preparation activity that will help your child develop independence. For kids, it is practical life learning, a boost to self-esteem, and snack time all in one! Every time my daughter wants a banana she wants to cut it “all by herself.” I set her up at her Montessori toddler table and away she goes. You may also like Squeezing an Orange Montessori Practical Life Activity. 1. Put on apron or shirt. It doesn’t matter what you use, it only matters that it acts as a signal that it is time to work. 2. Present the materials as shown below. Montessori practical life activities occur from top to bottom and left to right to prepare the child to learn to read. 3. Have your child sit in their toddler seat at their toddler table (if you have one) to do the activity. If you have never done this activity present it first. You will need to demonstrate how to do this activity the first time that you offer it. Complete each step in the exact order in the exact way that you want your child to do it from start to finish. Make sure you are deliberate in your actions. Everything proceeds from top to bottom and left to right to gently encourage reading readiness. Carefully pull each peel down and put it directly into the compost bowl on the right of the cutting board. 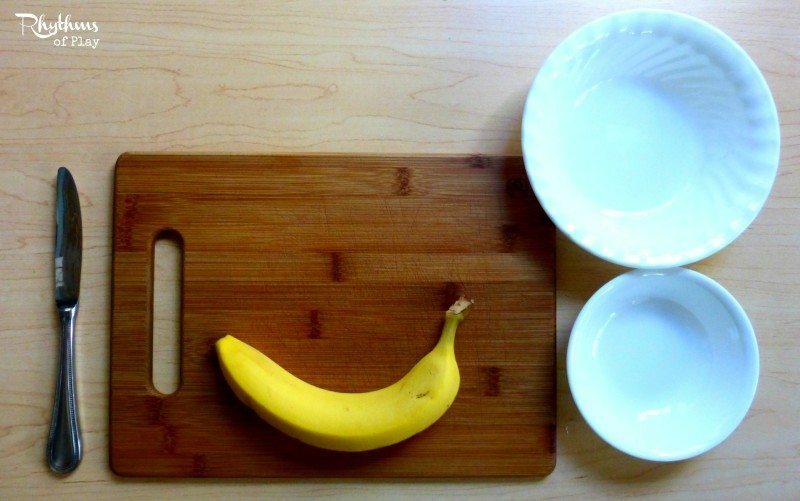 Next, take the butter knife and carefully demonstrate cutting one piece, picking it up, and placing it in the food bowl on the right until the banana is completely cut. Cut one piece of banana at a time. Cut then place. After each slice of banana is cut immediately put it in the food bowl to the right until the banana is completely cut. Remove the food bowl and have your child help you clean up and put their apron or shirt away to signal that their work is complete. Allowing children to incorporate the sequential manner of the entire process helps build healthy work habits. 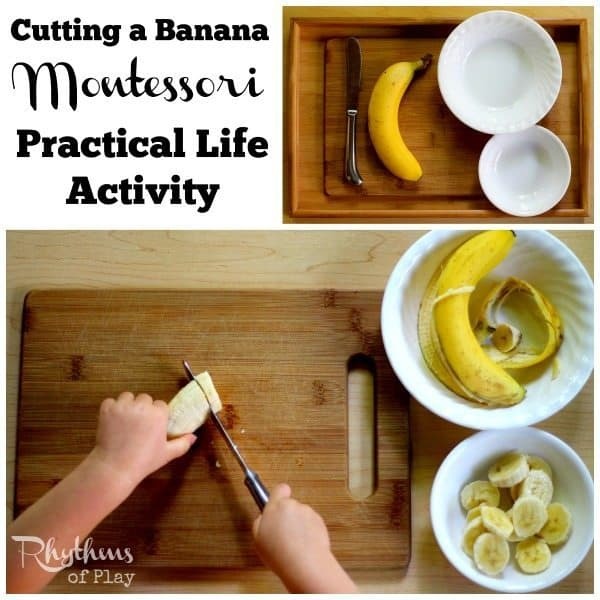 Cutting a banana is a simple Montessori practical life activity for food preparation. Activities like this help toddlers develop self-confidence and self-sufficiency in the kitchen, make preschoolers feel like they are making a contribution at home, and help elementary aged kids build confidence and skills. It’s an easy homeschool learning activity that only takes minutes to set up. Try it today! Wonderful! You know I’m a fan of Montessori Practical Life! For a leftie would you have them cut from the left side of the banana?